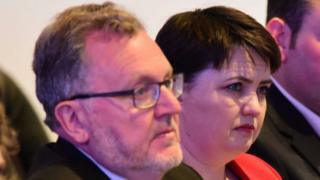 Scots Tory leader Ruth Davidson and Scottish Secretary David Mundell could resign from their roles over a possible Brexit compromise, BBC sources say. Scotland's Brexit Minister Mike Russell said it was "an astonishing development". Sources have told the BBC Ms Davidson and Mr Mundell have made it clear they would resign if Northern Ireland faces new controls that separate it from the rest of the UK - because that could fuel the case for Scottish independence. 'Any deal that delivers a differentiated settlement for Northern Ireland beyond the differences that already exist on all Ireland basis (eg agriculture), or can be brought under the provisions of the Belfast Agreement, would undermine the integrity of our UK internal market and this United Kingdom. The Scottish government's Constitutional Relations Secretary Mike Russell told the BBC's Sunday Politics Scotland programme: "This is an astonishing development, not that Ruth Davidson holds any position in the UK government, but to say that you'll resign if Scotland is not treated as badly as everywhere else strikes me as a complete dereliction of duty. "They're elected by people in Scotland and here they want Scotland to suffer the hardest of Brexits. That strikes me as a ludicrous position and one in which we should be saying, have they really come to this?" First Minister Nicola Sturgeon tweeted: "We'll resign if you do anything that makes Scotland think there's a better alternative to a hard Tory Brexit' say Mundell and Davidson!